ENTM Extension Newsletters > Pest&Crop newsletter > Articles > 2018.9 > Asiatic Garden Beetle Damage Reported! Grubs of the Asiatic garden beetle have been recently found damaging corn seedlings in northern Indiana counties. As noted in the past, their presence and damage is highly associated with light-textured (i.e. 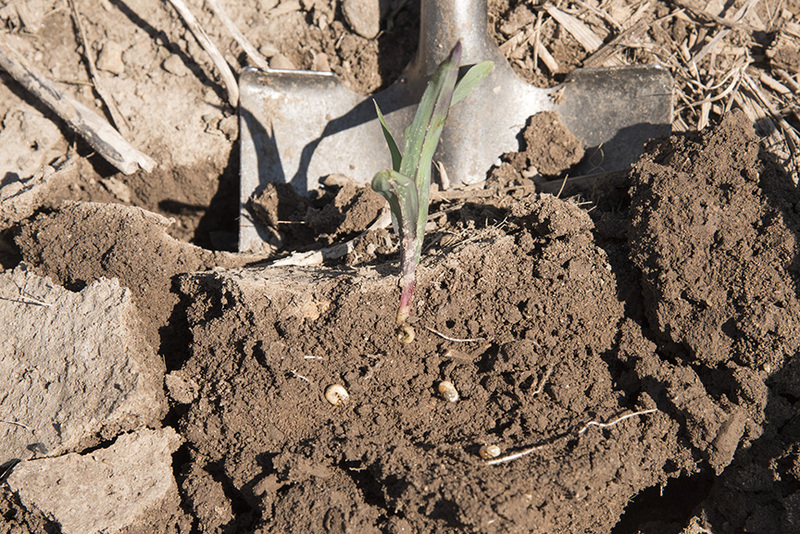 sandy) soils, and is generally most prevalent in corn following soybean. For the first time, we have documented damage in northern Wabash County, near North Manchester. A reminder that there are no “rescue treatments” for this pest. In any event, grub damage will soon be tapering off as they begin to pupate in the soil. From reports thus far, it appears that damage is not as widespread as last year. Later planting likely contributed to that. 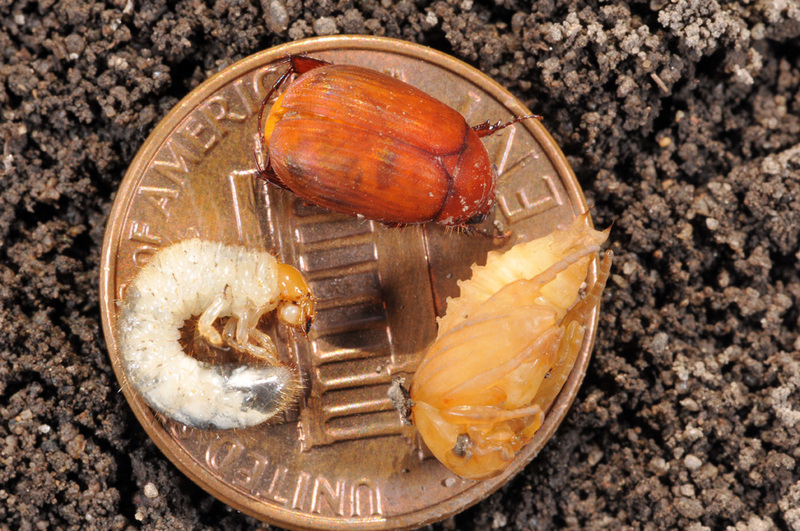 Asiatic garden beetle grub, pupa, and adult. Adults of the Asiatic garden beetle, present mostly in July and August, are somewhat undescribed in terms of their habits, because they are principally active at night. Decades-old literature suggest that the adult has nearly a hundred hosts, including a range of crops, flowers, and weeds. Those living where these beetles are present and active, will notice their affinity for coming to bright lights. Homeowners may notice garden plant leaves, (e.g., strawberry, carrot, rose, sunflower) disappear, yet unable to find a culprit. We have heard stories, and seen video, of damaged plants being dug up to reveal hundreds of beetles “bubbling” out of the soil. Our desire is to better understand what attracts beetles to crop fields to lay eggs in summer, causing grub problems the following spring. As mentioned, it is often soybeans planted on sandy, and or gravelly, soils. Many unknowns, e.g., tillage, growth stage, weeds, row spacing, fertility, etc., may, or may not be factors in attracting beetles to lay eggs. Your observations are certainly welcome (765-494-4563). Volunteers to lay on their backs in soybean fields overnight during July, with a flashlight, are certainly needed! Damaged corn seedling and Asiatic garden beetle grubs.